To describe the therapeutic use of CIRCLE software (Carl Zeiss Meditec, Jena, Germany) for the management of retained lenticule tissue after complicated small incision lenticule extraction (SMILE). Two patients were referred for consultation and treatment due to intraoperative complications during SMILE. In case 1, a black patch during laser delivery caused the lenticule to be torn irregularly from the undersurface during extraction and a sliver of it was retained in the pocket. Case 2 presented with false plane dissection and a completely retained lenticule on anterior segment optical coherence tomography. Both cases were managed using the CIRCLE software by converting the cap into a flap, thus making access to the interface possible. In case 1, after lifting the flap a small sliver of tissue was found in the interface, which was dissected, following which a 20-µm phototherapeutic keratectomy was done to smooth the interface. In case 2, after lifting the flap the edge of the retained lenticule was identified by using an endoilluminator and the lenticule was separated and subsequently removed. Both cases showed significant improvement in uncorrected distance visual acuity, corrected distance visual acuity, and Objective Scatter Index score on day 1 after repair surgery. CIRCLE software may be successfully used for managing retained lenticule tissue apart from performing enhancement after SMILE. A 33-year-old woman presented with a history of undergoing SMILE in both eyes 4 months previously for myopic astigmatism of −1.00 −3.75 × 15° in the right eye and −2.50 −4.25 × 170° in the left eye. The surgery was uneventful in the right eye, but the surgical course in the left eye was complicated, leading to a suboptimal outcome. On presentation, her uncorrected distance visual acuity (UDVA) was 20/20 in the right eye and 20/60 in the left eye, correcting to 20/40 partial with −1.00 −1.00 × 125°. 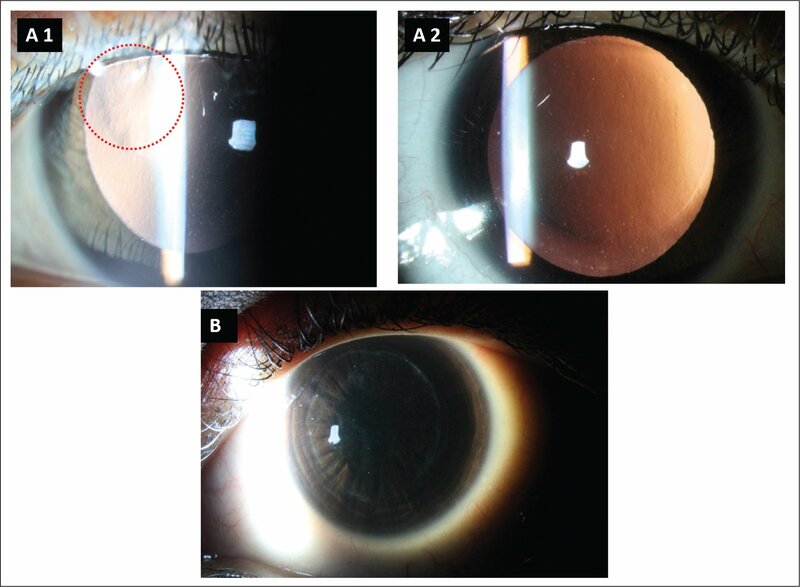 On reviewing the surgical video (Video 1, available in the online version of this article), a large black patch was noticed during the lenticule cut creation, which extended approximately from the center of the cornea toward the access incision superiorly. Consequently, the surgeon had difficulty in separating the lenticule tissue corresponding to this area. However, he was successful in extracting the lenticule by performing the manual dissection, and the lenticule appeared to be intact on inspection. Because the lenticule was extracted completely, the possibility of having retained lenticule tissue was deemed to be remote. However, postoperative topography with the Pentacam HR (Oculus Optikgeräte GmbH, Wetzlar, Germany) showed irregular astigmatism and central steepening (K1 [flat keratometry] = 44.20 diopters [D], K2 [steep keratometry] = 46.30 D, Sim K [simulated keratometry] = 45.20 D) (Figure 1A1). Tissue irregularity was also noticeable in the superior part of the cornea in the clinical photograph taken in retroillumination, after dilatation (Figure AA1, available in the online version of this article). 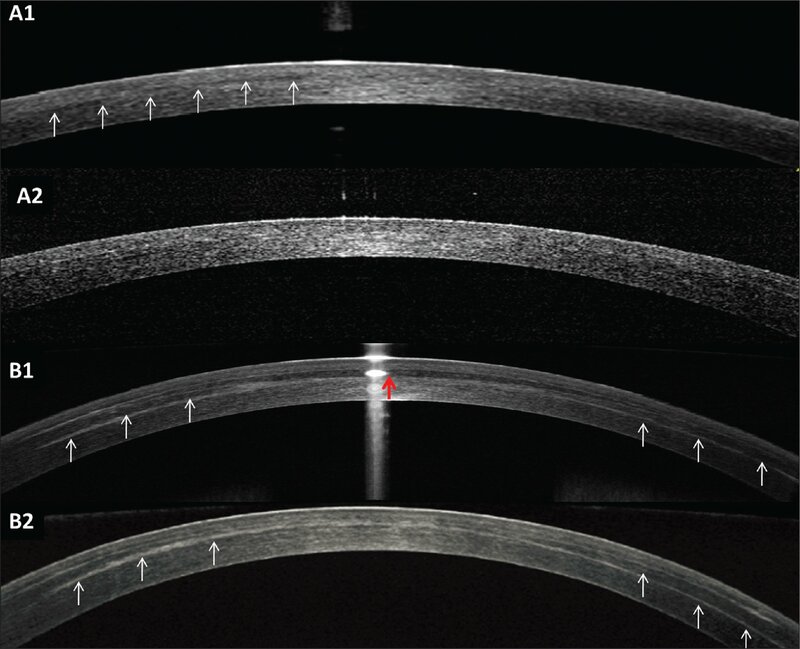 Anterior segment optical coherence tomography (AS-OCT) (Optovue; iVue, Fremont, CA) showed an area of hyporeflectivity and irregularity, but did not reveal any retained tissue (Figure 2A1). 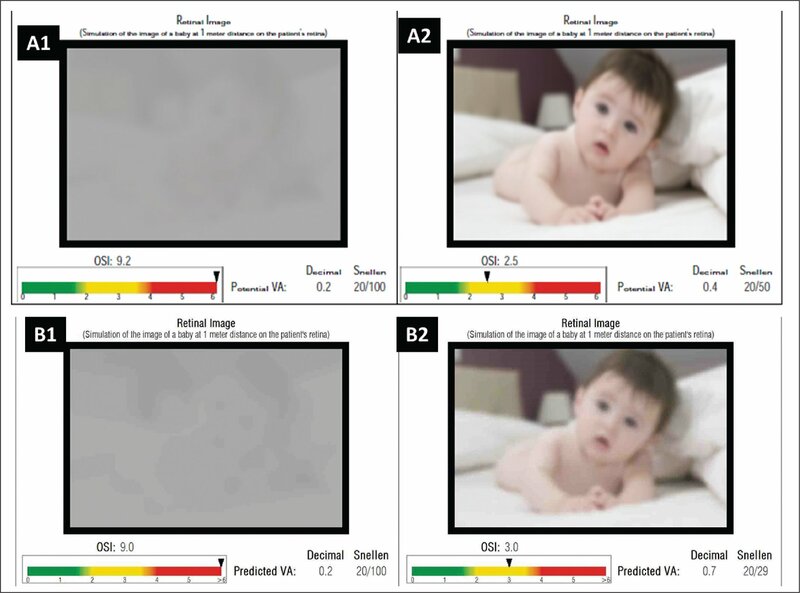 Visual quality as assessed with the HD Analyzer (Visiometrics SL, Terrassa, Spain) showed poor quality of vision with an Objective Scatter Index score of 9.2, suggesting high optical scatter in the interface (Figure BA1, available in the online version of this article). These findings led us to conclude that there were interface irregularity and scarring due to excessive tissue manipulation, which was causing irregular astigmatism and a worsening of CDVA. Pentacam HR (Oculus Optikgeräte GmbH, Wetzlar, Germany) axial curvature map of case 1 (A1 = before and A2 = after repair surgery) and case 2 (B1 = before and B2 = after repair surgery). Note that both cases show irregularity and steepening in the center of the pre-repair topographies (A1 and B1) and regularization or corneal curvature and uniform flattening after repair surgery (A2 and B2). Clinical photographs of case 1 (A1) before repair surgery. The red circle highlights the area corresponding to the black patch, leading to irregularity in the corneal tissue. 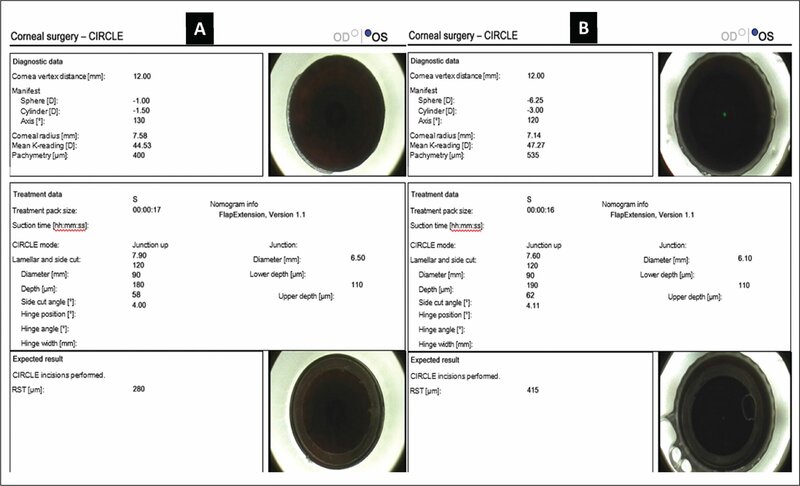 (A2) Post-repair surgery clinical photograph shows regularization of the corneal contour. (B) Case 2 after repair surgery shows mild diffuse interface scarring, sparing the visual axis. Anterior segment optical coherence tomography of case 1. (A1) Before repair surgery, arrows pointing toward an irregular and hyporeflective area, suggesting tissue edema and scarring but no residual tissue. (A2) After repair surgery. Anterior segment optical coherence tomography of case 2. (B1) Before repair surgery, red central arrow pointing toward retained lenticule and white peripheral arrows suggesting the false plane. (B2) After repair surgery, showing persistence of the false plane after lenticule extraction. HD Analyzer (Visiometrics SL, Terrassa, Spain) images of case 1 (A1 = before and A2 = after repair surgery) and case 2 (B1 = before and B2 = after repair surgery). Both cases showed significant improvement in the Objective Scatter Index scores after surgery, suggesting improvement in the visual quality. CIRCLE software was programmed to create a 7.9-mm flap using the ‘C’ or junction up pattern at 120 µm, which was the same depth at which the cap of the primary SMILE procedure was made (Figure CA, available in the online version of this article). A nasal hinge was used. The plan was to gain access to the interface and correct the interface irregularity by performing a phototherapeutic keratectomy (PTK) treatment of 50 µm on the stromal bed. However, to our surprise, after the flap was separated, an oval sliver of tissue approximately 2.5 × 3.5 mm extending from the center to the edge of the superior incision was found adherent to the underlying stromal bed (Video 2, available in the online version of this article). The treatment plan was modified on the table and we decided to attempt the separation of this remnant tissue. The tissue was gently separated using a Seibel's spatula, followed by which a minimal PTK of 20 µm was performed using the MEL 90 excimer laser (Carl Zeiss Meditec) to smooth out the interface due to old scarring. The interface was washed with balanced salt solution, following which the flap was repositioned. While repositioning the flap, a ridge of raised epithelium was noted in the center. Epithelial debridement was performed, followed by placement of a bandage contact lens on the eye. One week postoperatively, the UDVA improved to 20/20 partial in the left eye and CDVA improved to 20/16 with +0.25 −0.50 × 40°. Topography showed regularization of the corneal contour (K1 = 40.30 D, K2 = 41.50 D, Sim K = 40.90 D) (Figure AA2). 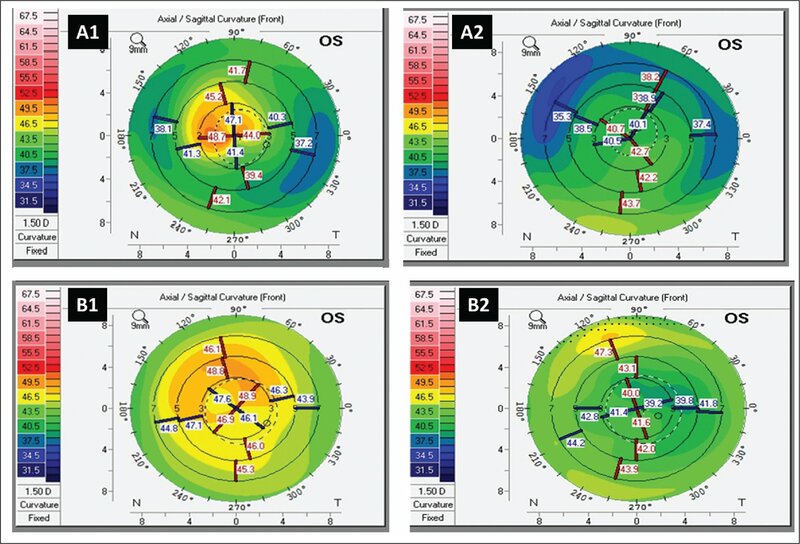 Both the AS-OCT and dilated clinical photography showed a more regular and clear interface (Figures 1A2 and 2A2).The Objective Scatter Index score also improved from 9.2 to 2.5, suggesting a significant improvement in the quality of vision in the left eye (Figure BA2). Repair treatment planning with CIRCLE software (Carl Zeiss Meditec, Jena, Germany) for cases (A) 1 and (B) 2. A 31-year-old woman presented with a history of undergoing SMILE 2 days previously for a myopic refractive error of −5.00 D in the right eye and −5.25 D in the left eye. The procedure in her right eye was uneventful, but the left eye had intraoperative difficulty, due to which the surgeon was unable to extract the lenticule and had to abandon the procedure. On presentation, her UDVA was 20/16 in the right eye and 20/60 in the left eye, which was correctable to 20/20 partial with a subjective refraction of −4.00 −2.00 × 10°. The surgery video was reviewed and it was found that the femtosecond laser pattern delivered to the cornea was normal and did not show any black spots, opaque bubble layer, or suction loss during the laser delivery stage (Video 3, available in the online version of this article). The surgeon first identified both the superficial and deep lenticule planes and then dissected the superficial plane. However, while dissecting the deeper plane, he created a false plane deeper to the posterior lenticule and continued to perform a lamellar dissection in this plane until the edge of the side cut all around. However, he was unable to extract the lenticule with the microforceps because there was no side cut created at the depth of the false plane, due to which he abandoned the case and referred the patient for further management. The topography of the eye showed irregularity, increased pachymetry, and diffuse elevation in the central and superior part of the cornea (K1 = 46.70 D, K2 = 47.80 D, Sim K = 47.20 D) (Figure AB1). AS-OCT (Figure 2B1) showed the lenticule in situ, with the presence of a lamellar plane at approximately 300 µm depth in the mid periphery, deeper to the posterior lenticule cut. Optical quality was poor with an Objective Scatter Index score of 9 (Figure BB1). The pupil was dilated prior to the surgical intervention. Similar to the first case, the CIRCLE software was used to program a 7.6-mm flap at 120 µm and a nasal hinge using the ‘C’ or junction up pattern (Figure CB). The flap was separated to expose the interface. A fiberoptic illuminator was used for the identification of the edge of the lenticule after switching off the microscope light, which was then gently dissected using a Siebel's spatula and separated from the stromal bed (Video 4, available in the online version of this article). The interface was washed and the flap repositioned. At 1 month postoperatively, both UDVA and CDVA improved to 20/20 and 20/16, respectively, with a subjective acceptance of a minimum cylinder of −0.25 D @ 80°. The topography became regular (K1 = 40.60 D, K2 = 41.10 D, Sim K = 40.90 D) (Figure AB2) and the AS-OCT showed clear interface, with the persistence of the false deeper plane (Figure 2B2). Correspondingly, the Objective Scatter Index scores also improved from 9 to 3 after repair surgery (Figure BB2). There was minimum stromal scarring evident from the clinical photograph taken with sclerotic scatter, but it did not involve the visual axis (Figure AB). We recently published the management and outcomes of retained lenticules or their fragments following complicated SMILE surgery, wherein the importance of detailed clinical evaluation including AS-OCT to assist the extraction of retained tissues for restoration of best corrected visual acuity was emphasized.7 We reported three such cases that required exploration through the original SMILE surgery incision. However, the current article discusses a different approach in these complicated situations, which is an “off-label” indication of the CIRCLE software. Briefly, the CIRCLE software is a dedicated software in the VisuMax femtosecond laser system that enables the conversion of the SMILE cap into a flap to allow the surgeon to perform excimer laser–assisted enhancement for any refractive inaccuracies.8 However, its use for therapeutic indications arising out of complicated SMILE scenarios has not been explored much. Chansue et al.9 published their safety and efficacy data on SMILE enhancement with CIRCLE software in 27 eyes and retained lenticule tissue extraction in one eye. However, preoperative data and post-repair surgery results of that particular case are not provided in this case series. The ideal management of retained lenticules or their fragments is surgical exploration of the pocket through the original SMILE incision. Before contemplating exploration, however, the size and location of the retained tissue should ideally be confirmed by AS-OCT, topography, and dilated clinical photography.7 On the contrary, in the current two case scenarios discussed, we preferred to use flap conversion enabled by CIRCLE software instead of the original SMILE incision for surgical exploration. This is because the complications in both of these cases were unique and warranted an open exploration. In the first case, a retained lenticule tissue was not suspected initially because the extraction of the lenticule was complete and the margins of the lenticule were found to be intact on inspection. Moreover, AS-OCT of the eye was not conclusive and did not reveal the obvious presence of retained tissue. Conversion to flap was contemplated with the aim of smoothing the irregular interface with PTK, which was thought to have occurred due to forceful and excessive stromal tissue manipulation. It was only once the flap was separated that a thin sliver of tissue (which had split from the undersurface of the lenticule while separating the deeper plane) adherent to the stromal bed was recognized, and hence the treatment plan was modified. In the second case, the surgical video and AS-OCT had revealed the formation of a false plane due to lamellar dissection, deeper to the lenticule cut with complete retention of the lenticule. In this scenario, it also would have been challenging to remove the retained lenticule through the original SMILE incision because a false plane was created along with multiple planes of entry seen on AS-OCT. Also, once a false plane is created, the chances of the dissector going repeatedly into the same (false) plane may be high due to distortion of the corneal lamellae, making the identification of the original plane even more challenging. Hence, in such situations, it may be better to perform “open exploration” by converting the cap into a flap, which would provide better access and visibility of the interface compared to pocket exploration through the original interface, where access to the interface is limited. Finally, this method may also be employed to rescue retained lenticule tissue following complicated SMILE if surgical exploration through the original incision fails or the surgeon does not feel confident about removing the retained fragments through the old incision. With regard to the method of flap creation, currently only CIRCLE software can enable interface access without creating a femtosecond laser pass through the interface using four different patterns of junctional cut, lamellar ring, and side cut.8,9 It is not recommended to use the “Flap module” and cut a new flap at the same depth as the original cap thickness, because this would create another laser pass through the interface, potentially increasing the irregularity. Another option for accessing the interface could be creation of a new side cut, programmed at the edge of the original lenticule plane, similar to the technique of mini-flap creation for LASIK enhancement previously described.10,11 However, this feature is not available with the current model of the femtosecond laser used to perform SMILE. In their experimental study on rabbit eyes, Riau et al.8 compared four different CIRCLE patterns for flap creation after SMILE. They concluded that CIRCLE pattern ‘D’ (ie, lamellar ring adjacent to the cap cut) was the most optimal to be used for flap creation in cases of SMILE re-treatment. They found that the flaps produced by pattern ‘C’ (lamellar ring anterior to the cap) were also easy to lift, with minor intrastromal resistance experienced during the lifting process, and the transition between the lamellar ring and cap cut was hardly discernible in these corneas. In our experience, pattern ‘C’ was safe and easy to use for flap creation, without any additional difficulty. The second case also describes a unique way of identifying the edge of the retained lenticule that is adherent to the stromal bed, after flap lift. The oblique illumination with an endo-illuminator may be superior to the coaxial light of the surgical microscope of the VisuMax femtosecond laser for better visualization of the lenticule edge. Once identified, the separation of adherent lenticule may be carried out easily, without causing further damage to the interface. Because these cases had a complicated treatment history, it would have been desirable to have a longer follow-up for potential complications such as epithelial ingrowth. However, further follow-up data were not available, so the long-term safety and stability could not be evaluated. The therapeutic use of CIRCLE software for managing retained lenticule tissues may be justified in certain situations arising out of complicated SMILE, such as when the cause of interface irregularity is not evident on clinical examination and AS-OCT, lenticule stuck on the stromal bed due to false plane dissection, or failed surgical exploration through the original SMILE incision. To our knowledge, this is the first detailed report describing the successful use of CIRCLE software for managing interface irregularity due to retained lenticule tissue, other than its indication for enhancement after SMILE. Of course, the obvious down side of this option is the creation of a flap, which defeats the primary purpose of SMILE (flapless correction).12–16 However, in our experience, it may be a safer option in the above described complicated scenarios in SMILE due to the potential advantages of better visualization of the interface and less tissue manipulation, resulting in favorable visual outcomes. Qiu P-J, Yang Y-B. Analysis and management of intraoperative complications during small-incision lenticule extraction. Int J Ophthalmol. 2016;9:1697–1700. Binder P, Blanton C, Garg S, Teus M, Waring G IV, . Understanding technology advances in refractive femtosecond laser platforms. Cataract & Refractive Surgery Today. March2018 (suppl). https://crstoday.com/articles/2018-mar/understanding-technology-advances-in-refractive-femtosecond-laser-platforms/. From Nethradhama Superspeciality Eye Hospital, Bengaluru, Karnataka, India. Dr. Ganesh is a consultant to Carl Zeiss Meditec. The remaining authors have no financial or proprietary interest in the materials presented herein.